iPads in the Library too! iPads in the classroom and in the library! Librarians at Penn recently had a chance to explore mobile technology with the iPads at WIC. Join us at Weigle Information Commons for another Gadget Day on Wednesday, December 7, 2011. We have a day of workshops on the latest gadgets and tools including Google Hangout, Evernote, Firefox Extensions, Audience Response Sytems (like PollEverywhere, TurningPoint and others) and iPads in the Classroom. Check out the schedule for the day and register online. Bing Maps is hitting the roads of the UK with its 360 degree camera mounted vehicles so I thought it was time to give it a serious look at how it compares to my standby online maps at Google. 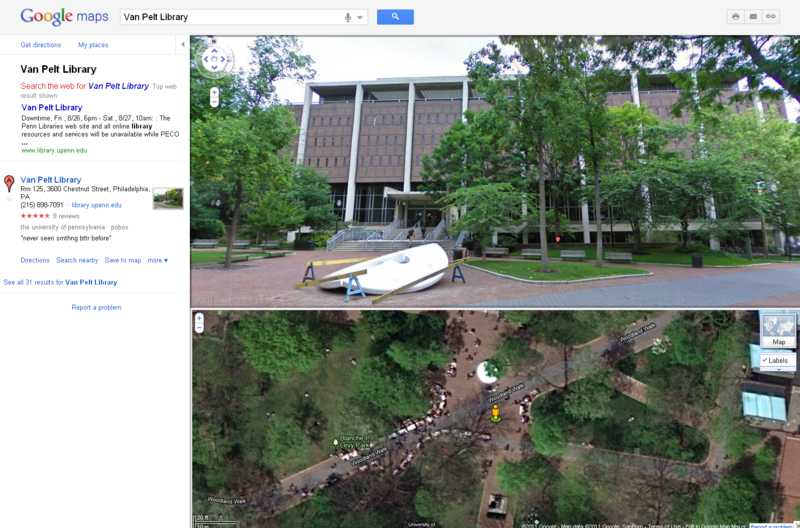 I am a long time Google user, but not necessarily a loyalist, so let the best map win! Bing Maps has the same essential functionality as Google Maps: giving directions, finding businesses and pin pointing locations and, using satellite and 360 imagery. How do they stand up to each other? When it comes to 45 degree angle views, Bing came first. Bing will also automatically switch to what it decides is the best view as you zoom, taking you from street map to 45 degree images as soon as you get close enough. The available of 45 degree images from Google was also hit or miss. Mission: Coffee break. One of my favorite Google Map features is clicking on a pin point and using “search nearby” for finding whatever is on my mind. 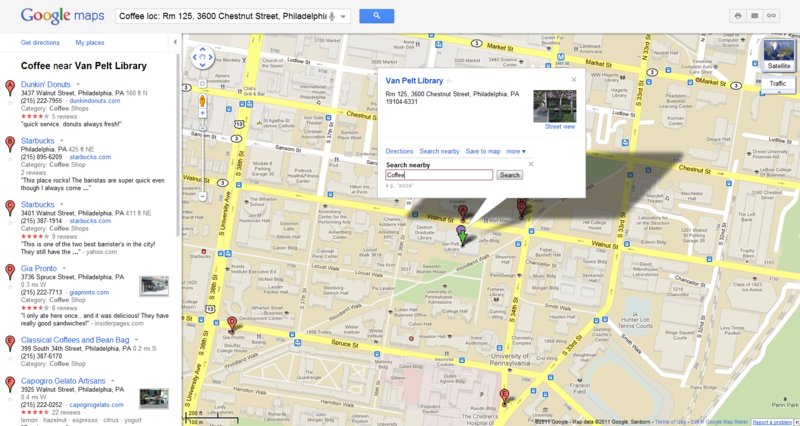 A keyword search shows me the results listed on the left and the pin points on the map. Bing on the other hand made me browse by category rather than search for businesses by keyword (unless I’m missing something). Also, Bing did not give me the distance between my location (Van Pelt) and my coffee options listed in the search results. 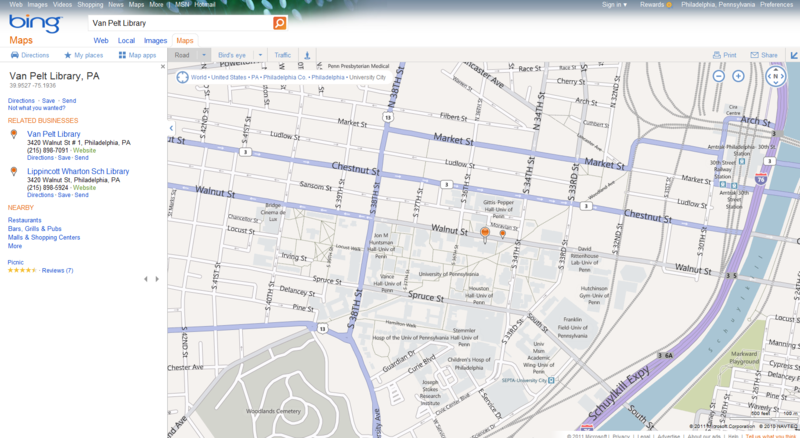 Bing also answers Google’s Streetview with Bing Streetside. 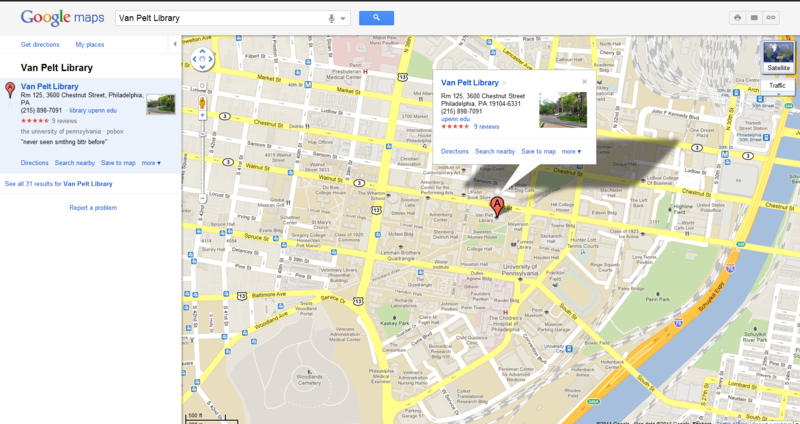 If you are searching for Van Pelt Library, Google is your answer here. 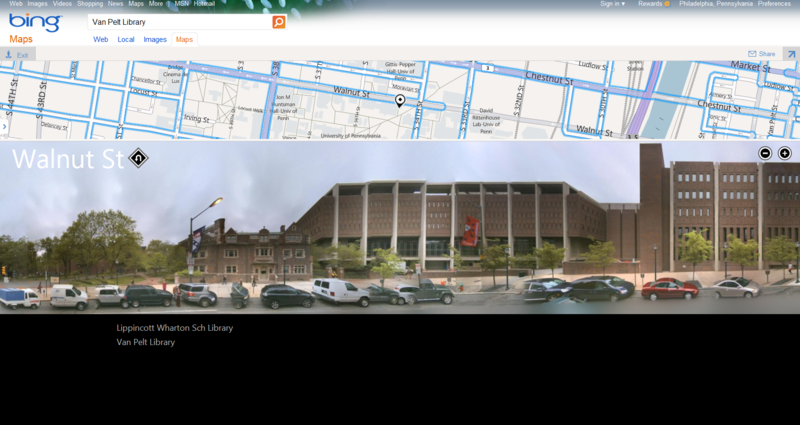 Bing’s Streetside was limited to public roadways for vehicle traffic but Google has the walkways on campus covered, giving you a great view of the front of the library. 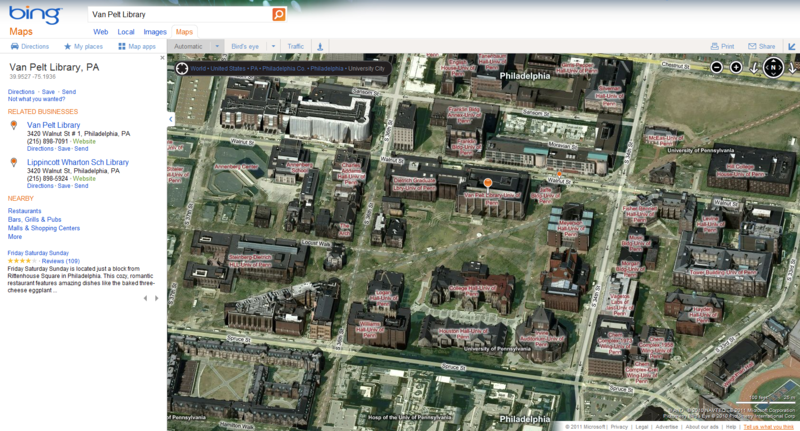 The imagery from Bing Maps and the wide availability of 45 degree angle views makes browsing fun. On the other hand the location services from Google win out over Bing in my book. In the end, I think that they both have a place in the arsenal of online map tools with many more features to explore. 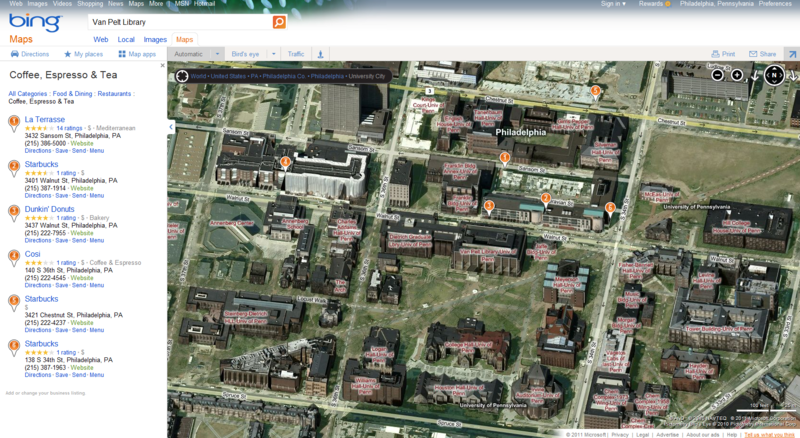 For example: Bing’s Map Apps. What do you think? 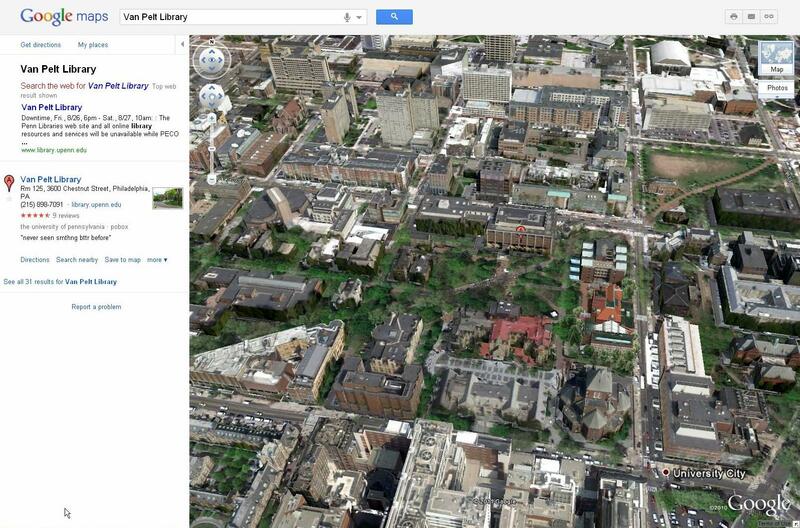 How do you use Bing Maps and Google Maps? Gadget Day is August 23! 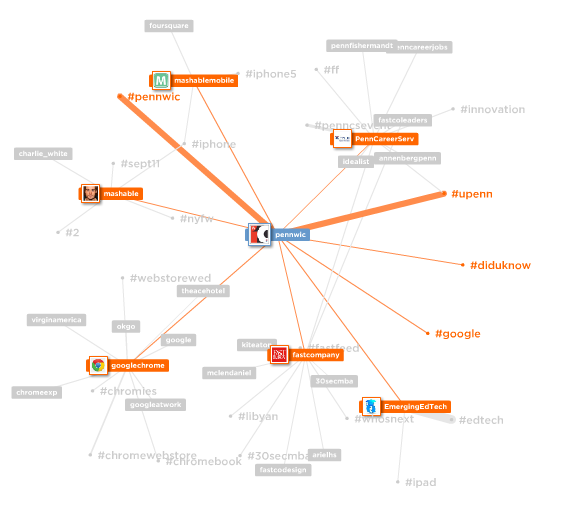 Gadget Day is August 23! WIC will host a day of workshops dedicated to the latest gadgets and tools. Test drive programs like Evernote, Prezi, Tumblr, WordPress and Flickr or try out one of several iPad sessions for fun and creative ways to get the most out of your tablet device. Explore a variety of smart phones and tablets. Check out the full schedule for the day and register online.